Sources close to the couple told Express that not just senior leaders but even cadre from Andhole constituency made phone calls to Padmini Reddy to express their anger. HYDERABAD: As differences inside Congress senior leader and its manifesto committee chairman Damodar Rajanarasimha’s family spilled onto the political stage, both Congress and BJP received a big shock on Thursday. 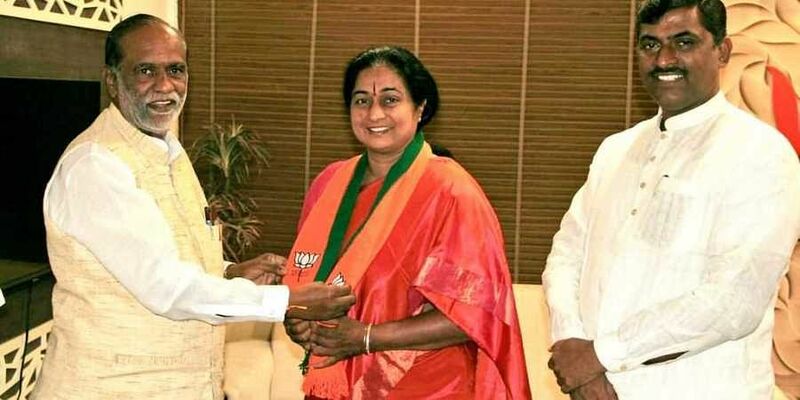 It all started in the morning when Rajanarsimha’s wife Padmini Reddy joined Bharatiya Janata Party in the presence of BJP’s national general secretary P Muralidhar Rao and Telangana BJP chief K Laxman at the party’s office in Hyderabad. And, predictably, the news of Padmini Reddy’s defection spread across the State like wildfire. Springing into damage control mode, Congress leaders started calling her and expressed their displeasure over her defection. Soon enough, in the evening, she announced that she would be back to Congress. It is learnt that the couple’s daughter Trisha Indira played a key role in bringing her mother Padmini Reddy back to the party. While joining BJP, she said she was ‘deeply impressed with PM Modi’s policies’. At the time, it is learnt, her husband was campaigning his constituency. He was surprised on hearing about his wife’s departure. Whatever the end result may have been, Padmini’s departure and return to the Congress could be considered a blow to the party’s campaign. At a time when the party has been mustering all its resources to take on the ruling TRS, party leaders felt that Padmini Reddy’s ‘coup’ was a big blow to Congress. “With what face will we campaign. If a senior leader, and that too the manifesto committee chairman’s wife, deserts the party, how can we continue believing in our manifesto. When your own family member doesn’t have faith in you, who do you believe?” lamented a party leader to Express in the afternoon. As soon as the news broke, TPCC and AICC leaders swung into damage control. Sources close to the couple told Express that not just senior leaders but even cadre from Andhole constituency made phone calls to Padmini Reddy to express their anger. Some of them even travelled from Sangareddy to Hyderabad. In the evening, it was announced that Padmini Reddy would hold a short press meet. To the shock of everyone present there, she said, “I’m changing my decision to join BJP. I shall remain in the Congress. I didn’t expect so much resistance and disappointment from cadres. Keeping in view the feeling of party workers, I decided to return to Congress.” Again, understandably, another party was left red-faced. This time it was BJP. Speaking to Express, BJP spokesperson Krishnasagar Rao said, “It seems family politics have spilled into politics. This lady seems to be unstable with her decisions. We believe she was pressured into returning to Congress. We have nothing against her. People come and go. We only invited her to be a karyakarta (worker),” he said. Hyderabad: Telangana BJP president K Laxman on Thursday said that party president Amit Shah’s visit had come as a huge shot in the arm for the party. “All it took were two meetings by Amit Shah to scare TRS party chief K Chandrasekhar Rao into wondering about his party’s future. You can see this in his behaviour — instead of answering our questions, he is using filthy language against us,” he said. Laxman said that the TRS party had no right to “seek blessings from voters” as the government had not fulfilled any of its promises it had made in 2014. Fisherman thought fishing was successful. But the fish vanished from the fisherman's basket. What a mystery.